Meow reow mew mew purrrrr. That's kitty speak for "Take me home!" Perfect for cuddling, this soft kitty makes a very unique gift. 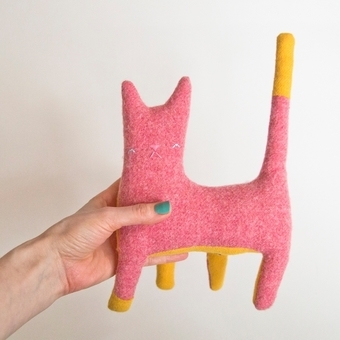 • Every kitty is one-of-a-kind and made from my original pattern. • Each one is numbered on their back in the order they were created. • Kitty has a quirky, hand embroidered face. • Kitty's legs are uniquely positioned so that you can see all four legs at once. • It is made out of high quality, woven wool that has been felted, and is stuffed with eco-friendly fiberfill. • Measures approximately 6 inches wide (15cm) and 9.5 inches tall from foot to tail (24cm). • Kitties are mailed First Class through the United States Postal Service. Please let me know if you would liked them shipped differently.